An oil-train-fueled explosion would devastate Spokane, but is a proposed enforcement method even legal? Oil trains roll through Spokane multiple times every day. Every day, several trains hauling coal or crude oil move through downtown Spokane on elevated tracks. Depending on who you ask, the trains carry needed energy to create electricity, fuel industry and run our cars, or they do all those things while presenting the risk of a fiery derailment and explosion that could devastate downtown. On ballots sent out this week, Spokane voters will be asked whether the city should make it a civil infraction for companies to move uncovered coal train cars or untreated crude oil by rail through the city. The measure is labeled as Proposition 2, even though it's the only proposition on the Nov. 7 ballot for the city of Spokane, because another proposition was challenged in court and removed. 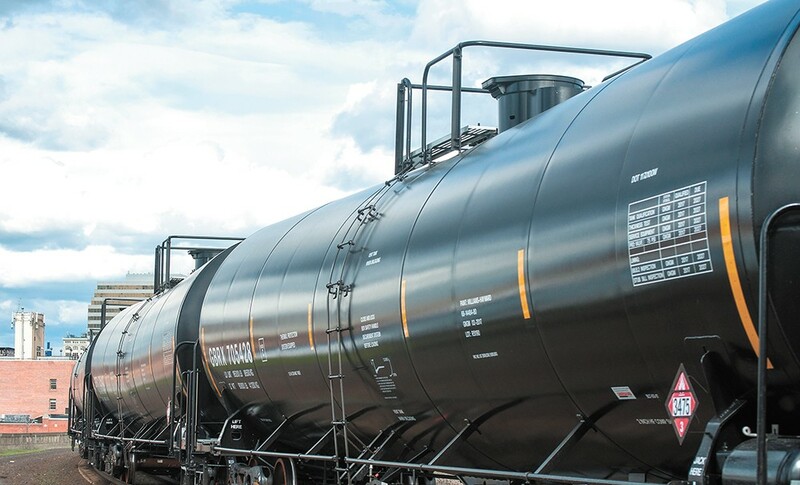 If passed, rail car owners would need to cover their cars full of coal and treat their crude oil to get it to a pressure of 8 psi (pounds per square inch) before shipping it through the city, or face a fine of $261 per car, the same dollar amount for all civil infractions in the city. Proponents say the measure will increase safety while still allowing trains through the city. Opponents say this type of fix would not only be unenforceable, but would be too expensive. Jim Lee is chairman of Safer Spokane, the group that collected signatures to get the measure on the ballot and helped bring the idea forward with City Councilman Breean Beggs, who wrote the measure in his private capacity as an attorney. When asked why people should support the measure, Lee says it's all about minimizing harm and danger in the city, not about banning oil and coal trains. "It's a public safety issue, and that is what it's all about as far as we're concerned," Lee says. While the risks of a fiery train derailment are slim, small derailments happen all the time, Lee says. And when conditions are right when an oil train derails, the consequences can be devastating. In Lac-Mégantic, Quebec, when a crude oil train derailed in that small town's center in July 2013, 47 people were killed; cleanup and repair costs are estimated in the billions of dollars. "The risk of a derailment with fire and explosion in downtown Spokane is very real and would be very, very catastrophic," Lee says. "It's really a numbers game, kind of a Russian roulette of when, not if, a train will derail in Spokane." As for coal trains, the campaign wants coal cars to be covered not so much because a coal derailment would be dangerous, but because of concerns that coal dust can degrade tracks over time and increase the risk of an oil train derailment, Lee says. Michael Cathcart, spokesman for the Committee to Protect Spokane's Economy, a group of rail, coal and oil businesses, and other industries and citizens who oppose the measure, says that people should vote against Proposition 2 first and foremost because it's illegal. "It violates federal law," Cathcart says. "The hearing examiner and the [city council] policy adviser have both said it's illegal, the Center for Justice [Riverkeeper] questions it. ... I'd say it's pretty universally panned in Spokane, based on the fact it's illegal." If it's passed, Cathcart says the city could face very expensive litigation. He also argues that in lieu of moving oil and coal by train, the other option would be truck. "If it could be implemented, which again is a significant question mark, then all that would happen is you take oil and coal, and you move it from the railroad to an alternative transportation source," Cathcart says. "The only alternative that exists currently through Washington state is the highways." That could put more people at risk because highway crashes are more frequent, and every single oil train would need 280 trucks to replace it, which would also increase greenhouse gas emissions, Cathcart says. Beggs and Lee say the trucking argument doesn't hold, because it wouldn't happen. Rather than truck the oil from North Dakota or pay the fine, it would make more sense just to stabilize the oil before transportation, they say. "You would not transport oil 2,000 miles with trucks. They would stabilize it," Beggs says. "The cost of stabilizing would be way cheaper than trying to have 18-wheelers doing it." Cathcart says his committee's research indicates that psi has little to do with oil's volatility, and to treat it to the levels required by the measure would cost millions of dollars in new infrastructure in North Dakota. He also says that the railroads have indicated if fewer trains were to roll through Spokane, some of the 500 regional railroad jobs would go away. Most of the debate around the measure has centered on whether it is even possible for the city to enforce. "We don't get to as the city of Spokane, nor should we be getting involved in interstate commerce issues," Cathcart says. "If we're going to block a few commodities a few activists in Spokane don't want to move through, what's to stop other communities from blocking other things, like Boeing airplane parts? It can quickly turn into a trade war." The railroads are common carriers, which means they don't get to choose what they transport, he says. What they have done is invest hundreds of millions of dollars in recent years in infrastructure upgrades on their rail lines in Washington, Cathcart says. And railroads are regulated at the federal level. But the version of the measure that voters will decide on is not intended to levy a fine on the railroads, but on the companies that own the rail cars, Beggs says. Perhaps more important, Beggs says there is still legal room for cities to regulate railroads with "gap filler" regulations until federal rules catch up. "In the National Railway Safety Act, [Congress] created a gap provision, which says if you've got a unique local danger, and the Department of Transportation hasn't yet promulgated a measure, you can do that as long as it's not too burdensome," says Beggs, who helped with litigation that changed national pipeline regulations following a June 1999 oil pipeline explosion that killed three people in Bellingham. "Instead of industry trying to slow down the federal rulemaking authority, it encourages them to speed it up, so they get a uniform rule." Safer Spokane argues that because the tracks are elevated through downtown and run over our single-source drinking water aquifer, Spokane has a unique local danger. Voters will have to decide if the court costs are worth the risk, Beggs says. If the city were to win in court, the legal costs would be maybe $100,000, he guesses, and if the city were to lose and the challengers were awarded legal fees, the cost might be as high as $1 million.